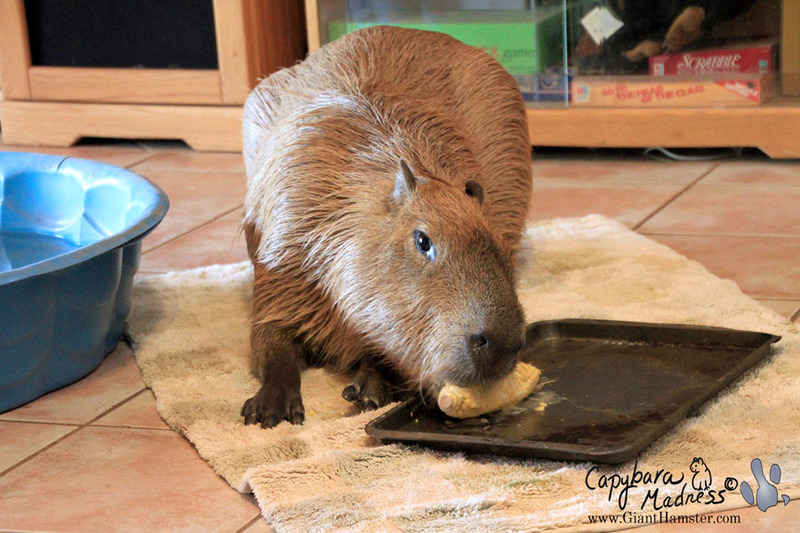 « 2014 Capybara Madness Calendar: What is it? If you’ve been following my blog, you know I’ve been having some problems with my teeth, cute as they are. In this post I’m going to give you an update on them AND I’m going to tell you about something really incredible that happened in my creek! How bad can my teeth be if I can still eat corn? And believe me, I can! If anything I am eating more corn now than ever. But Melly is taking my dental problem very seriously. I have to take medicine every single day. Unlike every other time Melly has tried to give me medicine, I actually like this stuff! The medicine is Marbofloxacin (Susp) 10mg/ml: 2.2 ml 1x daily. I get that dose because I weighed 53.9 kg. That’s about 119 lbs, which is a lot. But enough of that! Let’s move on to something more fun. Look! 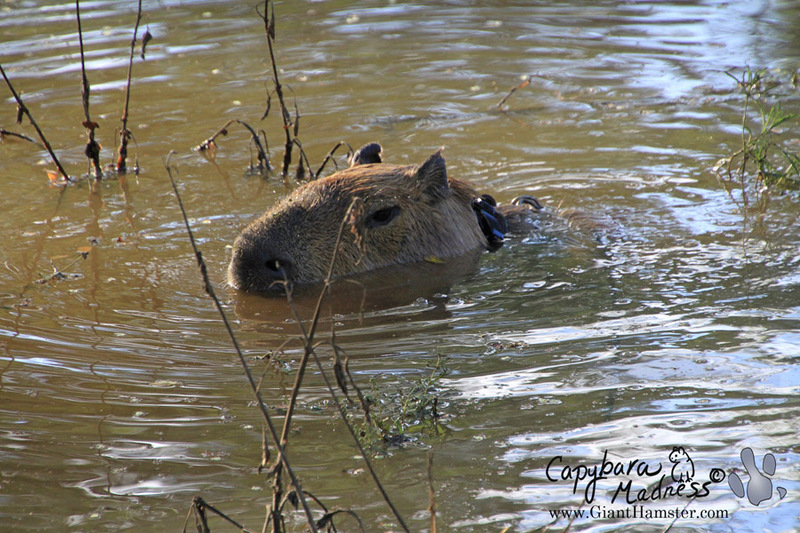 That is me coming out of Capybara Creek! I know I’ve posted about the mud in the creek quite a few times, but look what happened to it! It turned into muddy water! Muddy water that is deep enough for me to swim in and has lots of nooks and crannies for me to explore. Plus a bunch of dead plants that grew in there when it only had mud. This is the best thing ever! The creek is not as deep as my pool but it is longer and, in some ways, more fun. Only Melly says she will not come in with me. Ever. No matter how hot the day is. Sometimes I just don’t get her. I would stay in the creek all day if I could, which is why Melly says I have to wear my harness and leash. Apparently she doesn’t want me to have any fun. Rub, rub, rub. This is my leash. 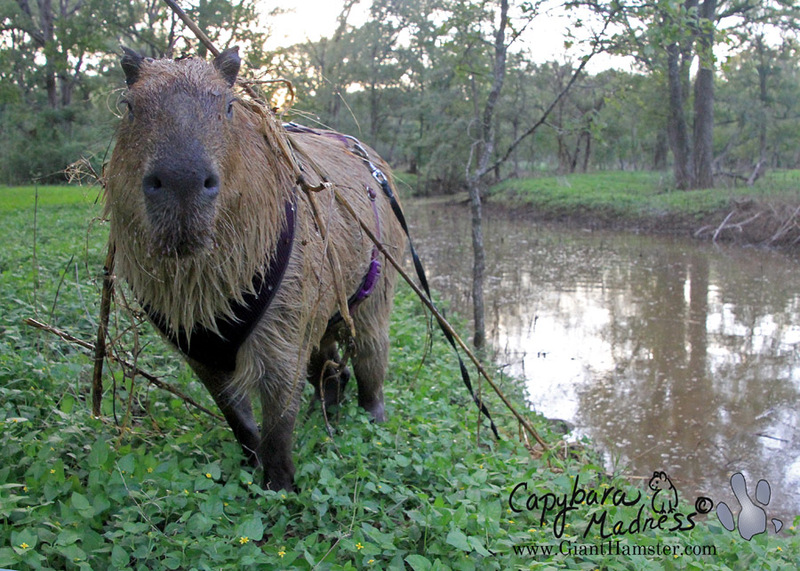 Even when I am in the creek I need to remind other potential capybaras that this leash is mine. I also try to mark as many plants as I can. 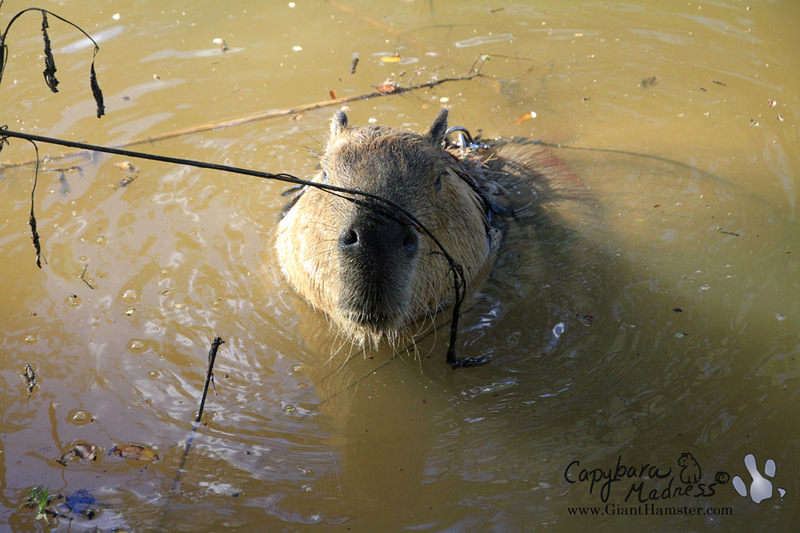 This is working because no other capybaras have tried to take over my property yet. In my pool I can hide in my inner tube but that is not so effective as hiding in these plants. I heard Melly asking where I was a lot of times. Sneaky ‘bara, that’s me. I hope to have a lot more posts about the creek since I am assuming Melly will keep it filled for me from now on. She claims the rain has to fill it, but I know how the hose works! Gari: So glad you are taking your medicine. The creek sure looks like fun – Melly doesn’t know what she’s missing by not swimming with you. Keep taking your meds, eating corn, swimming in the creek, and posting to your blog. Love your posts – they always make my day. so enjoy the videos & blog, hope the creek stays full of water for U. how long will you swim & play? Do you get cold & have to have a bath when you get out? Don’t you worry about Gari running into a venomous water snake? No, I don’t worry about venomous water snakes. The only one we have in this area is the water moccasin and I have never seen one here. He would be more likely to run into a western diamondback or a coral snake, but I don’t worry about those either. Happy to hear that you are doing better, Gari. Take your meds like a good boy and enjoy your creek! 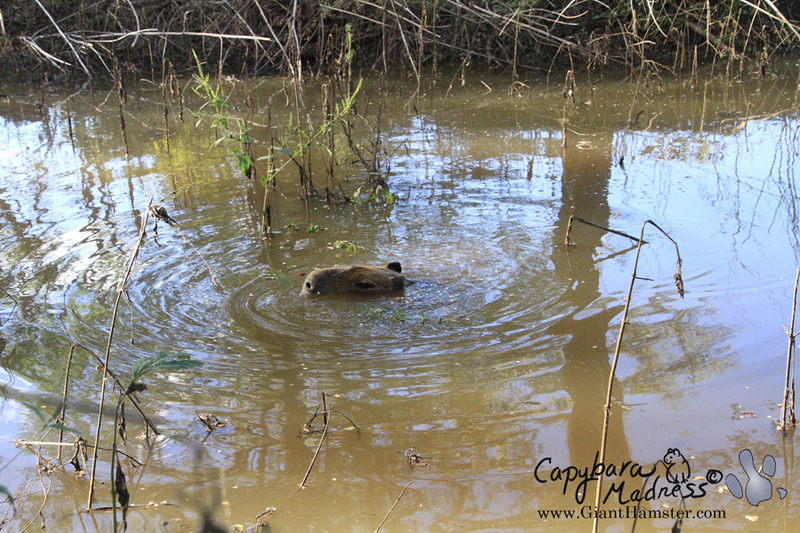 Gari you look wonderfuL and are truly enjoying swimming in the creek. Glad the meds are HOPEFULLY working and you are feeling better. Love to follow your blogs. What a wonderful creek! 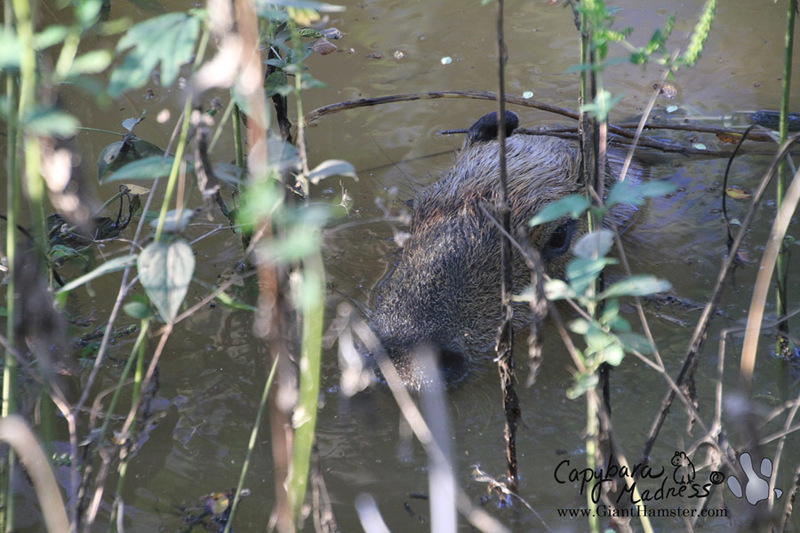 You look so grand being king capy in the creek! I am really glad you like your meds, and aren’t giving Melly a hard time about taking them. They will help you feel like eating even more things, and keep you strong! I do hope you continue to get enough rain to keep your creek full! Enjoy! That’s a great swimming creek! I hope Melly comes here and makes one for me! that’s right Gari! Melly better keep that creek full! 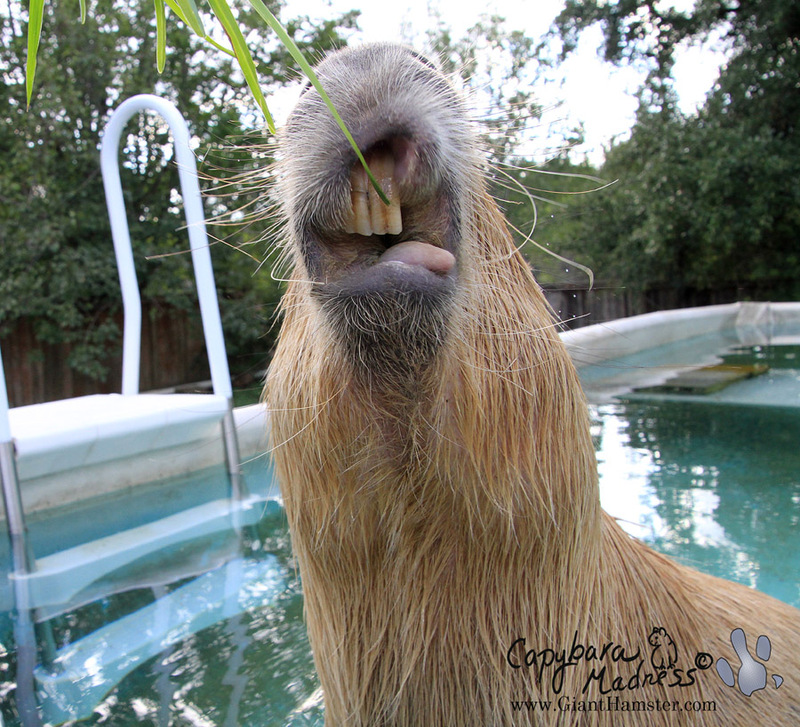 As Royal Ambassador of Capy Cuteness you needed worry about human trifles such as finding the longest hose ever and then paying for all that water! those are silly human concerns and she better keep the mud flowing! Hope all is well and the meds work! Gari, you are being a good boy by taking your medicine. No more boo-boos for Gari! And you own that creek, that’s for sure. Have fun, sweetie, and feel better.